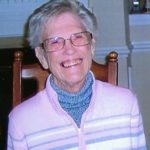 Yorktown, VA – Willa Mae Alderman, born May 10, 1931, passed away Saturday March 30, 2019. She was born in Carol Co., Virginia, and had been a resident of Yorktown since 1949. Willa Mae was a life-long member of Crooks UMC, She belonged to the Church Women United, and was a 4-H leader and Home-Dem member. She was actively involved in the York County Senior Center, and a member of the Yorktown Sassies. She was known for sharing her cooking, and her scrapbooks. Friends always looked forward to her annual Christmas letter. She was a loving wife, mother, grandmother, and great-grandmother. She was preceded in death by the love of her life,Clifford C. Alderman. Together, they raised 2 children and maintained the family business, Cliffs Auto Service of Yorktown. She is survived by her two children; daughter, Brenda Pezzana and her husband Dan of Williamsburg; son Gary Alderman and his wife Patti of Yorktown; 2 grandchildren Chris Pezzana and Lara Swank (Dylan); 2great-grandchildren Isabel and Jaxon Swank; one brother Herman Bowman of Roanoke Rapids, NC, and several nieces and nephews. She was predeceased by one brother, Cliff Bowman of Meadows of Dan, VA. A funeral service will be held on Wednesday April 3, 2019, at 12:00 noon at Crooks Memorial UMC. Internment will follow in Peninsula Memorial Park. Reception will follow the burial. The family will receive friends on Tuesday evening at Amory Funeral Home, from 5pm-7pm. Arrangements are being handled by Amory Funeral Home, Yorktown. Special thanks to the entire staff at Dominion Village of Williamsburg for their loving and compassionate care. In lieu of flowers, donations are being accepted in her name to the York Poquoson Social Services Special Welfare Fund, 301 Goodwin Neck Road, Yorktown, VA 23692.